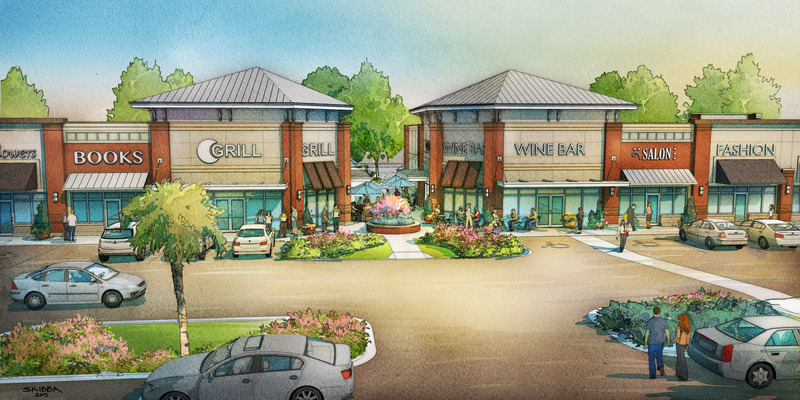 Raleigh, N.C., June 29, 2015 – Leading commercial developer, Crosland Southeast, announced it has closed on the land for Village Shops at Grande Dunes and River Place Shopping Center representing a planned $38 Million worth of retail development at completion. Publix has signed leases to anchor the 12-acre Village Shops of Grande Dunes in Myrtle Beach, S.C. located at North Kings Hwy. and 82nd Pkwy., as well as the 8-acre River Place Shopping Center in New Bern, N.C. located at South Glenburnie Road near Martin Luther King Blvd. (US 17). River Place will be the first Publix location to break ground in coastal North Carolina. Crosland Southeast is the landlord in each transaction and is responsible for leasing future shop space and outparcels. Austin Williams and Brad McGinnis, of Crosland Southeast’s Raleigh office jointly worked on the transactions and Chris Taft of Crosland Southeast oversees all commercial leasing. “We look forward to getting started on construction and announcing new shops and restaurants with outdoor dining that will complement Publix in each project,” remarked Brad McGinnis, senior vice president at Crosland Southeast. Southeast expects to start clearing immediately to begin construction and the project is slated to open mid-2016. Crosland Southeast closed Monday on the 8.2-acre assemblage of 8 separate land tracts for River Place Shopping Center, which is slated to feature a 49,098 sq. ft. Publix grocery store and 16,000 square feet of space for shops and restaurants. Demolition of the buildings will start in August and the shopping center will open late 2016. “As a native of New Bern, I am excited for the opportunity to bring Publix to town. River Place will make a lasting economic impact, attracting many other first-class retailers to the market, and creating at least 200 permanent jobs,” added Williams. These projects are part of Crosland Southeast’s $200 million development pipeline. The company brokered the first Publix store in the Triangle, which recently opened at the mixed-use Bradford development in desirable Cary, N.C in late 2014. Crosland Southeast and its partners have a long history of developing and leasing award winning retail and mixed-use developments throughout seven southeastern states. The five Crosland Southeast partners previously served as officers of the 74-year old Crosland LLC, and have a combined 115 years experience in the commercial real estate industry. Today, Crosland Southeast perpetuates excellence with its emphasis on retail acquisitions, advisory services, single-tenant development and the development of high-quality retail and mixed-use properties which epitomize placemaking at its finest. Their current development pipeline exceeds $200 million. For more information, visit www.croslandsoutheast.com.